After losing more than 120 pounds, Lifestyle Redesign success David Morrison is a new man, thanks in part to regular consultations with occupational therapist Ashley Uyeshiro ’08, MA ’10, OTD ’11. At his heaviest, David Morrison weighed 328 pounds and wore size 46 pants. He suffered from lower-back stenosis, which made even walking difficult, and sleeping problems and acid reflux were parts of his everyday life. 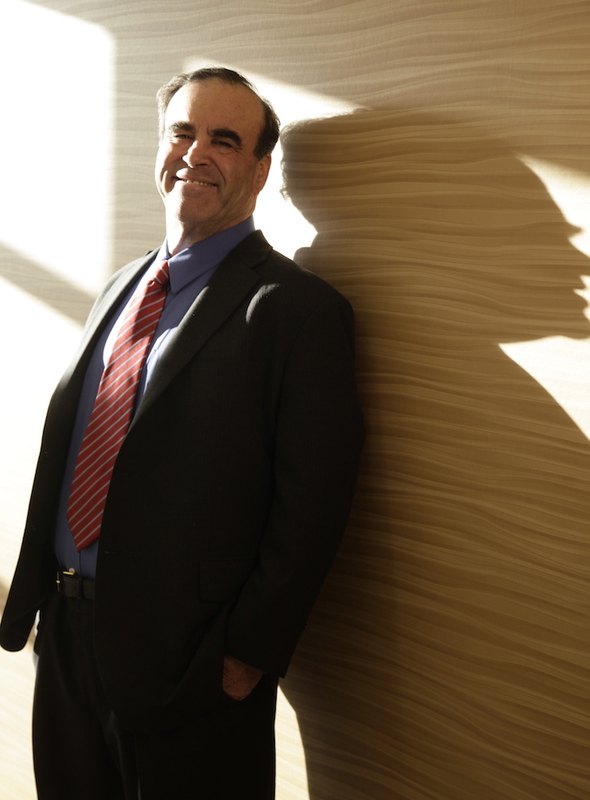 Though the 61-year-old banker from Alhambra, Calif., knew he needed to lose weight, he couldn’t find his own recipe for long-term success. That feeling of futility is likely familiar to anybody who has started — and stopped — a diet plan: A 2013 British survey found that 40 percent of people quit within the first seven days of starting a new diet, and only 5 percent of people still follow their diet after one year. So it was no surprise that Morrison moved on to more intensive strategies to control his weight. In 2010 he underwent a laparoscopic adjustable gastric band procedure — commonly known as lap-band — but soon discovered there wasn’t enough medical follow-through to help him adjust to his smaller stomach and new lifestyle. In 2012, at the advice of his physicians at the Keck Hospital of USC, Morrison decided to undergo gastric bypass surgery, a procedure involving separating a small pouch from the stomach and re-connecting the small intestine to engineer a new smaller “stomach.” The surgery drastically decreases the volume of food the stomach can hold and, therefore, the number of calories the body can digest. A month before his surgery, something else further inspired Morrison’s weight-loss plans: His mother fell ill and died from cancer. Morrison also realized he had his own goals left to accomplish that might not be possible if he kept walking the same road. He wanted to see his son excel in his screenwriting career. He wanted to see his daughter, who works in chemistry, get married and start a family. He dreamed of traveling and, as a member of his bank’s Toastmasters group, doing more public speaking. He also had yet to fully indulge his inner die-hard Trojan football fan. “My dream is to go to South Bend, Ind., to watch a Notre Dame versus USC game,” he says, with a smile. With all this in mind, the re-motivated Morrison went to Keck Hospital for bariatric surgery in December 2012. Now, more than 15 months later, Morrison’s down more than 120 pounds, weighing in at 206.8 (with a banker’s attention to detail, Morrison is very precise with his measurements). He admits it’s not been easy getting used to the changes. 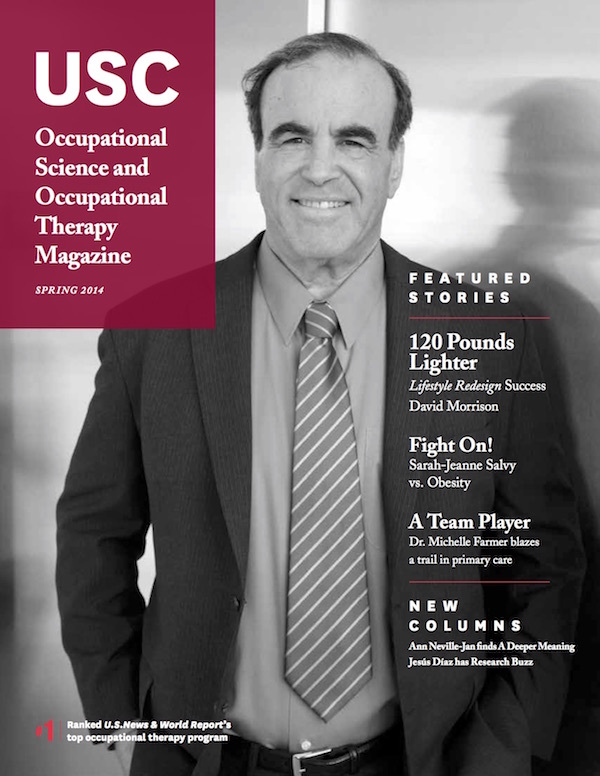 To make sure Morrison was successful and had the post-surgery support he needed to acclimate to his new life, his physicians suggested the Lifestyle Redesign Weight Management Program at the USC Occupational Therapy Faculty Practice. The program, a benefit covered for university employees under the USC Network Medical Plan, was developed in the 1990s to combat the complex issues facing the overweight and obese by customizing a lifestyle-focused program for each patient. Whether one-on-one or in groups, patients meet regularly with an occupational therapist to set realistic, activity- and routine-focused goals to create health-supporting habits that can reduce stress, improve overall quality of life and manage weight. Topics covered include healthy eating, physical activity and exercise, identifying healthy pleasures and non-food rewards and emotional issues tied to food. Morrison began meeting with Assistant Professor of Clinical Occupational Therapy Ashley Uyeshiro ’08, MA ’10, OTD ’11, at the Faculty Practice every other week. Together, they strategized lasting changes Morrison could make to stay healthy while also helping him cope with the changes he was experiencing. With Uyeshiro’s help, Morrison devised a workout plan — walking and stretching six days a week and swimming on the seventh day — and figured out what foods Morrison could eat. He learned how to control portion sizes which, because a bypassed stomach can stretch over time from over-eating, has been vital to his sustained success. And he’s increased his own sense of accountability so he doesn’t need to rely on Uyeshiro as much as he once did. Morrison now sees Uyeshiro once every four weeks and has started to grow more comfortable in his new body. “Just the fact that I can walk now from my car to my seat [at USC football games at the Los Angeles Coliseum stadium] is great,” he says. He’s even been able to find amusement in his transformation.